Looking at this list, I’m thankful to my mom for well-balanced, nutritious, and yet delicious meals growing up! When she would make hot rotis (which she now makes with tofu instead of oil) with a side of cilantro chutney (recipe to come), she would have to kick me out of the kitchen otherwise I would quickly ruin my appetite for dinner. I now have a family to cook for of my own. Although we love eating other cuisines, my husband and I still need our weekly fix of Gujarati food. I also want my kids to enjoy and appreciate the flavors we had growing up. 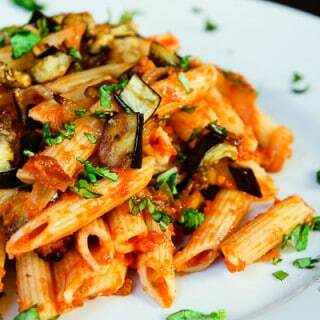 These dishes are not only second nature for me to prepare, but are healthy, tasty, and well-balanced. They also allow me to introduce new vegetables and lentils to my kids every week. 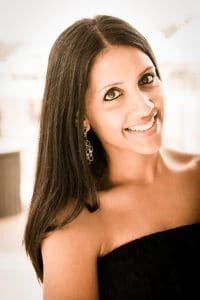 As I was browsing through the Indian recipes on my site, I realized that I’ve only posted a few of these recipes. Given how often I make traditional Gujarati meals, I figured it’s about time to add some more of these dishes. A few weeks ago my daughter and I were enjoying this Urad Dal Soup with Onions and Garlic, and I felt it was the perfect recipe to share. This recipe makes use of two lentils: Urad Dal and Chana Dal (also known as Split Bengal Gram). The major component is Urad Dal, which is skinned and split black lentils. These lentils are milder than their unskinned counterpart and have a creamy, white interior. 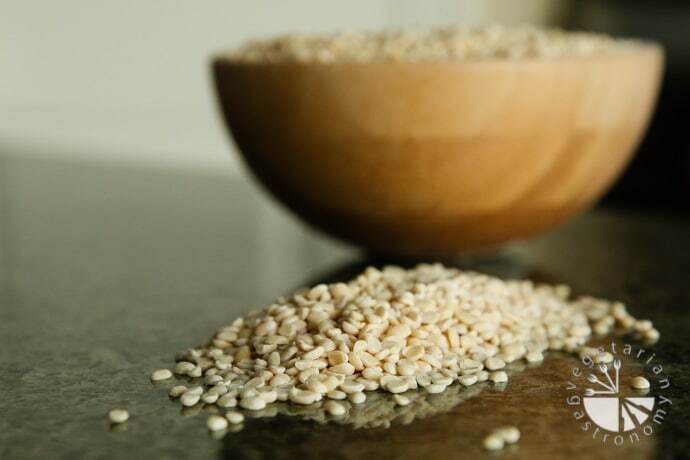 They have great health benefits, including one of the richest sources of protein and Vitamin B. 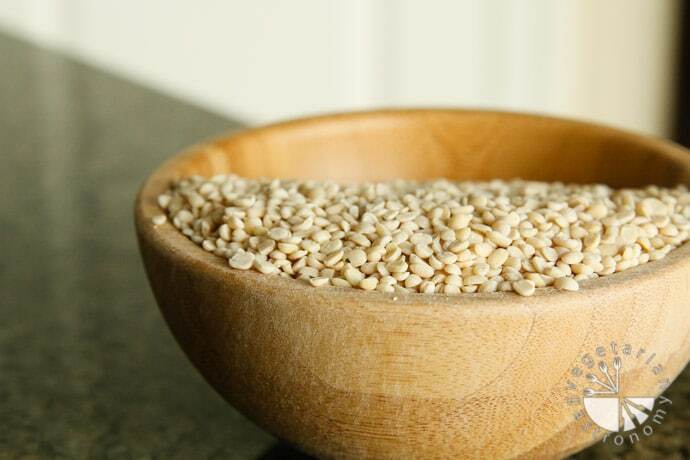 They are also a great sources of iron, folic acid, calcium, magnesium, fiber and potassium. I typically use Urad Dal when making my own Dosa batter (South Indian crepe, recipe to come) or soups such as this one. 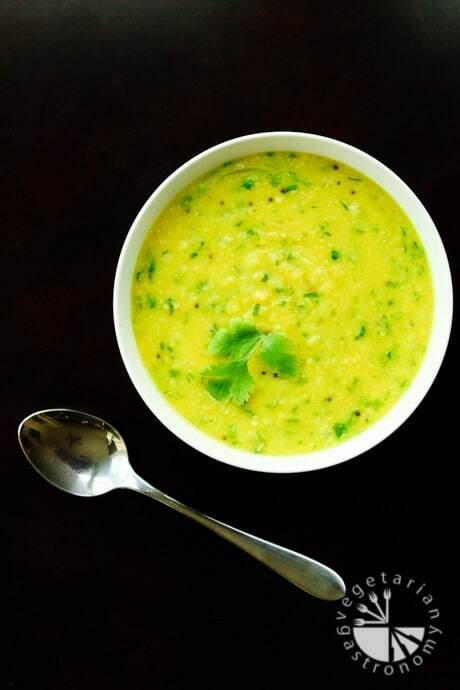 Urad dal, when skinned and split, makes for a great soup base because of is unusual moist and sticky texture. Most of the flavor in the soup comes from the lentils themselves cooked with onions, garlic, and a few common spices and herbs. If you’re looking for something easy and satisfying to make, try a bowl of this comforting soup! What is your favorite lentil? This lentil-based soup is the perfect protein-packed side to any vegetable dish! Immediately add the garlic, onions, and green jalapeno chili. Saute until fragrant and the onions start to become translucent. Be sure not to burn the mixture. If you find this happening, either add some more oil or turn down the heat. Add the cooked urad dal, cooked chana dal, turmeric powder, and salt. Saute with the onion-garlic mixture for a few minutes, mixing frequently. Add the water and the bring the soup to a gentle simmer. Once simmering, turn down the heat to medium-low. Continue to simmer on low heat until some of the water boils off and the soup becomes thick in consistency (about 10-20 min). If you start to feel the soup becoming too thick, you can add a little more water. Add the chopped cilantro. If needed, season once more with salt to taste. Simmer for additional 3-5 minutes. Garnish with some fresh cilantro and serve warm with roti, naan, or toasted french bread. Urad Dal - These are black lentils (or urad dal) that have been split and skinned. 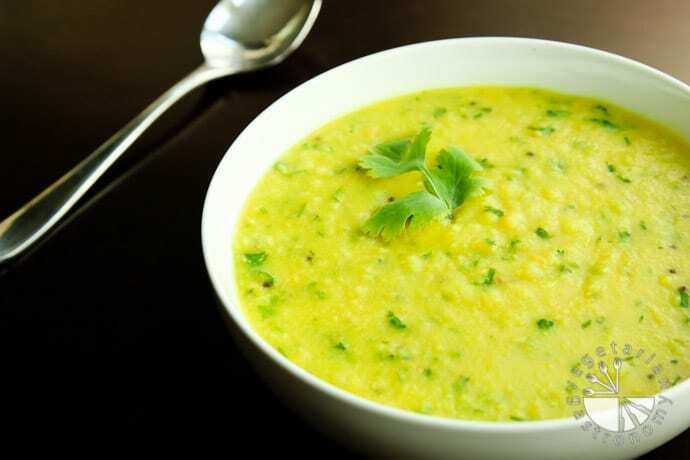 Chana Dal - Chana Dal is also known as Split Bengal Gram. Be sure not to confuse it with Yellow split peas, as they are not the same. 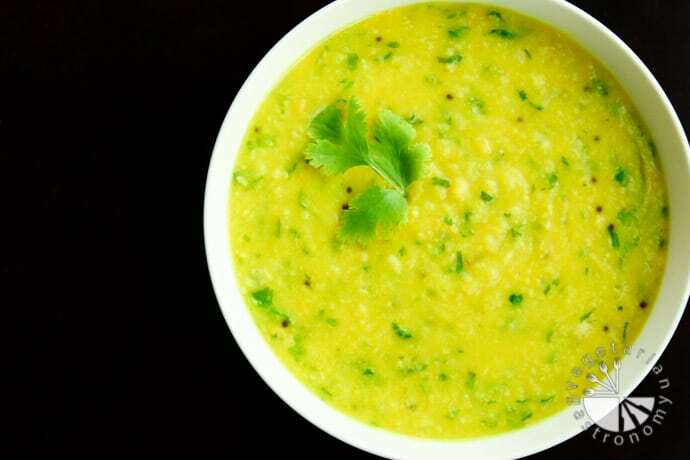 You can find this Dal at any local Indian market in bulk for cheap, or online. 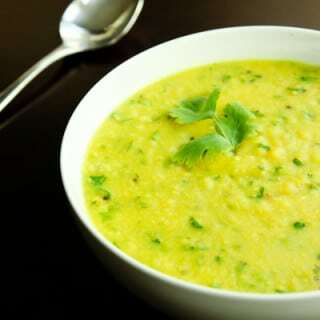 To Cook Dal - Combine both the Urad and Chana Dal in a bowl. Wash and soak in water for about 20-30 minutes. Drain the water and cook using one of two methods: (1) Pressure Cooker , or (2) Pot of boiling water. Cook the Dal until soft, but not mushy. Drain the water after cooking the dal. Hi Rita! It's super easy to incorporate! I've been meaning to post about it on my site but keep forgetting to measure the actual amount of tofu I add to the mix. So basically we used to make our chapati dough from whole wheat flour, oil, and water. So instead of the oil and water, my mom and I substitute in the tofu. 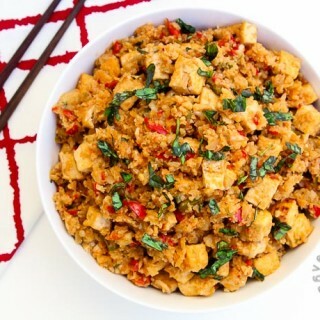 Use firm tofu and either mash it really well with your hands or grate and then mash it in a bowl. Then just add flour and combine until you get the right dough consistency of chapati flour! If you want, you can still add a spoon or two of oil. I've made tofu chapati with and without oil and it honestly tastes good either way.The only one difference I see is that chapati made with tofu tastes a little more dry the next day if you plan on using leftovers (although still absolutely fine). But when made fresh or the day of, I personally can't even tell the difference! I love it! My mom also makes thepla using tofu and shredded zucchini.I'll be sure to measure the exact portions I use when making the dough next time! Hope that helps and if you have anymore questions let me know. Thanks for visiting my site! Awesome thank you! You may want to check back later this week...i have a great giveaway coming up you may be interested in, follows along the lines of this Dal recipe! Let me know if you try this Dal!